The 18-year-old Galician and Red Bull KTM rider took the triumph in Mantua and completed the winter pre-season triplet with another exhibition. 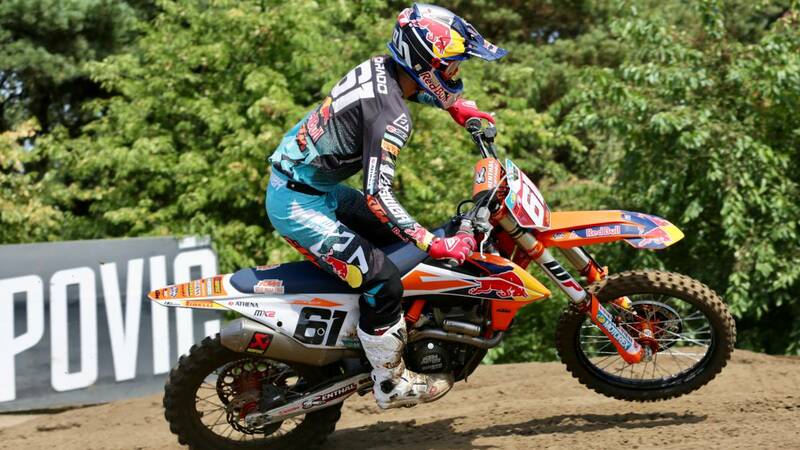 Jorge Prado has been given a victory triplet by the age of majority. The Spaniard has closed the three-race of the Internazionali MX, prestigious pre-season championship that is held every year in Italy and brings together the best riders in the world, with another masterful victory, this time in Mantua, to take the championship and show that the current MX2 world champion is also the favorite to reissue title. The 18 year old Galician dominated in Sardinia, in Ottobiano and now repeated in the Lombard city that received the riders with rain. "The start was good, but I failed in the first corner and several rivals have passed me, so I have to come back to take the lead and be able to shoot at my pace", explained Prado, who despite the initial error was already leading mediated the sleeve to sign an unquestionable victory. In addition, Prado allowed himself the luxury of fighting the victory to Cairoli and Nagl in the mixed sleeve that met in the Superfinal to the MXGP and MX2 riders ... even though the Spaniard had a 250cc KTM for the 450cc of his rivals. "I tried to ride to the maximum since the first lap, I was able to recover several places and in the end I tried to pass Nagl, but I could not. week and how has this championship ... We have started the season as we wanted ", closed the Spanish who already thinks about the start of the World Cup on March 3 in Argentina.